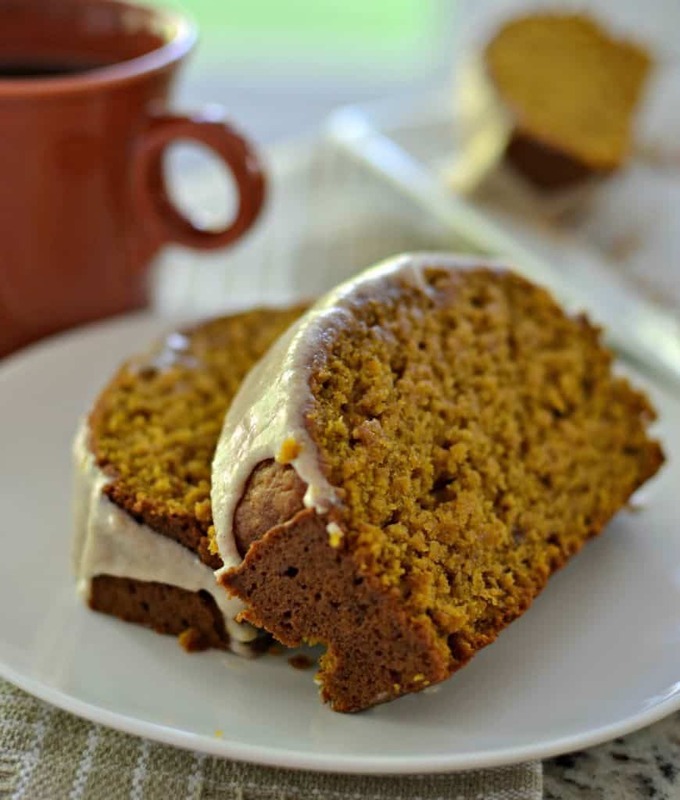 This easy delicious moist Pumpkin Bread Recipe is covered with a sweet cinnamon glaze. It is amazingly scrumptious and with its perfect blend of spice it will get you into the festive fall spirit. What better way is there to get into the fall mood than bake a couple of fresh loaves of pumpkin bread? This delectable bread is darn near the best pumpkin bread I have ever had. This bread is sooooooooooo moist! Oh how I know my daughters hates that word. She is in high school now and somehow someone elected her the word police. Well she is not here right now so let me go on and on about this bread. This amazing bread is drizzled with a to die for cinnamon allspice glaze while it is still warm. Oh do I have your attention now? Can you use fresh pumpkin to make pumpkin bread? The answer is a resounding yes. I prefer to use the pie pumpkins. They are sweeter, have more flavor, and have less moisture. They are the little pumpkins generally between 3-8 lbs. A 15 ounce can of pumpkin is just shy of 2 cups so you will need about a 3 lb. pie pumpkin for this recipe. Simply cut the pumpkin in half from the top down. Scrape out seeds and stringy fibers reserving seeds if you are going to roast them. Place cut side down on baking sheet and roast at 375 degrees for 1 – 1 1/2 hours or until tender. Remove from oven and allow to cool. When cool enough to handle scoop pulp from rind. Puree it in a food processor or simply mash it with an old fashioned potato masher. Place the puree in a sieve and set it over a bowl to catch the moisture. Let the puree drain for 1 hour. 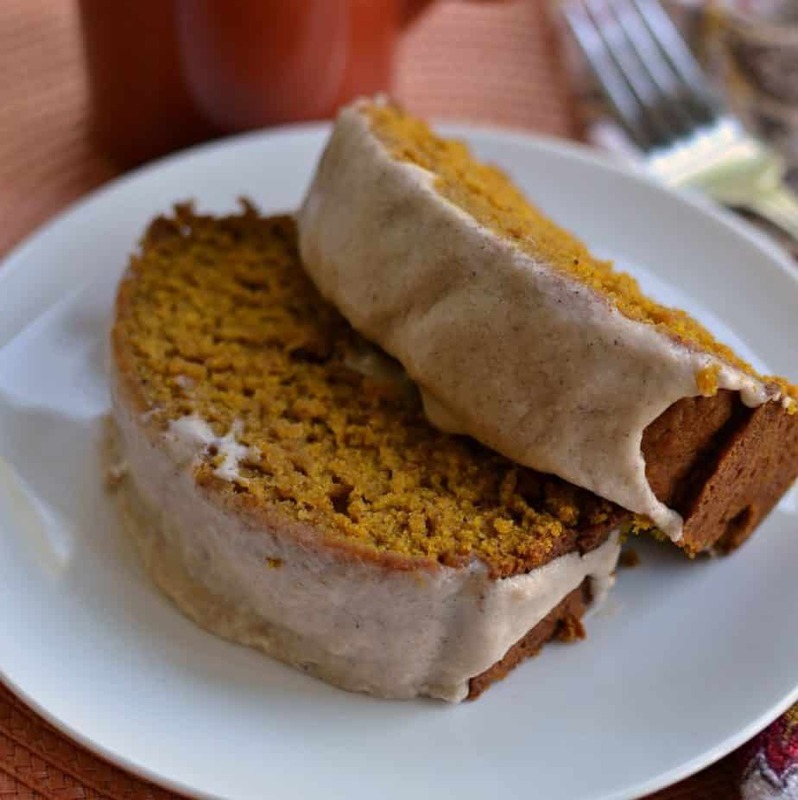 How do you make Pumpkin Bread Recipe with Cinnamon Glaze? I thought you would never ask. In medium bowl whisk together flour, baking soda, salt, ground ginger, ground cloves, nutmeg and cinnamon. In large bowl stir together pumpkin puree, eggs, melted butter, vegetable oil, sugar and brown sugar. Add dry ingredients to wet ingredients in three parts. Pour in loaf pans and bake. Cool for ten minutes and remove from pans. In small bowl whisk together powdered sugar, melted butter, milk, vanilla, cinnamon, allspice and cloves. Drizzle glaze over warm (not hot) loaves and allow to sit for twenty to twenty-five minutes. 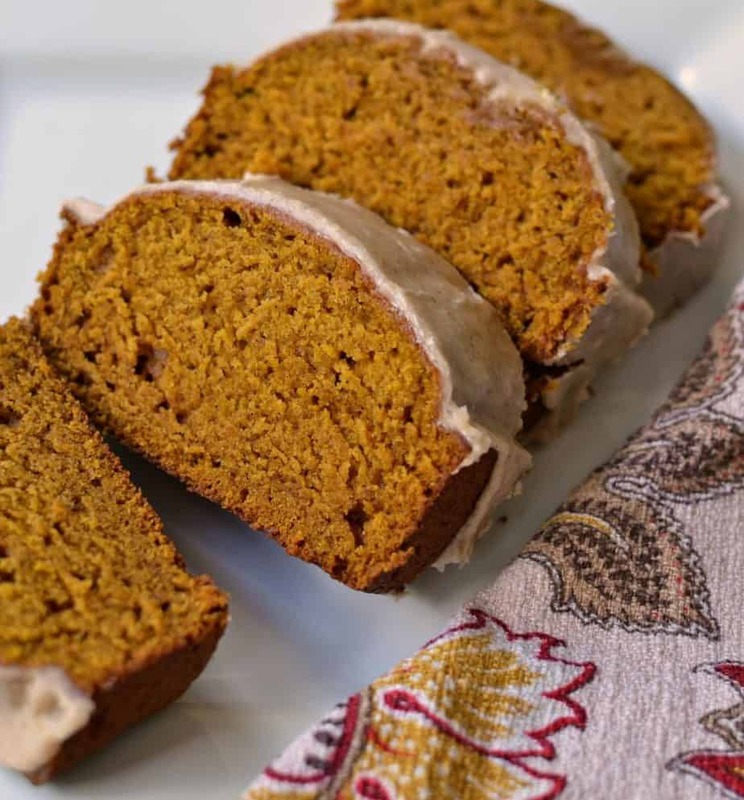 This Pumpkin Bread Recipe with Cinnamon Glaze is delicious, dependable and easy. Your family is going to love it and you will get a huge flavor blasted taste of fall. 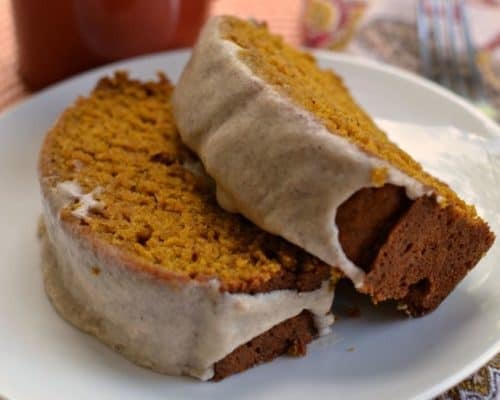 Other delicious pumpkin recipes you will love! This moist Pumpkin Bread Recipe is covered with a sweet cinnamon glaze. With its perfect blend of spice it will get you into the fall spirit. In medium bowl whisk together flour, baking soda, salt, cinnamon, nutmeg, ground cloves and ground ginger. In large bowl stir together pumpkin puree, eggs, melted butter, vegetable oil, sugar and brown sugar. Working in three parts add the dry ingredients to the wet ingredients and stir just until combined. Split evenly between two well greased 8 x 4 inch loaf pans. Bake at 350 degrees for 50 minutes or until toothpick inserted in center comes out clean. Cool for ten minutes and remove loaves from pan. In small bowl whisk together powdered sugar, melted butter, milk, vanilla, cinnamon, allspice and ground cloves. Drizzle over warm (not hot) loaves.